Colton Haaker came into EnduroCross round 3 ready to leave it all on the track. After setting a blistering pace during the Hot Laps word was out that Colton was not playing around. When the start gate dropped for the main event Colton came out with a solid 2nd place. Following Webb for a few laps Colton took his shot at the lead on lap 3 making a strong pass. Colton had to fend off some quick pressure from Webb who ended up taking himself and Roberts down. From that point on Colton ran away from the field stretching out his lead for the remaining 11 laps to the finish line unchallenged and just shy of 10 seconds in front of second place! 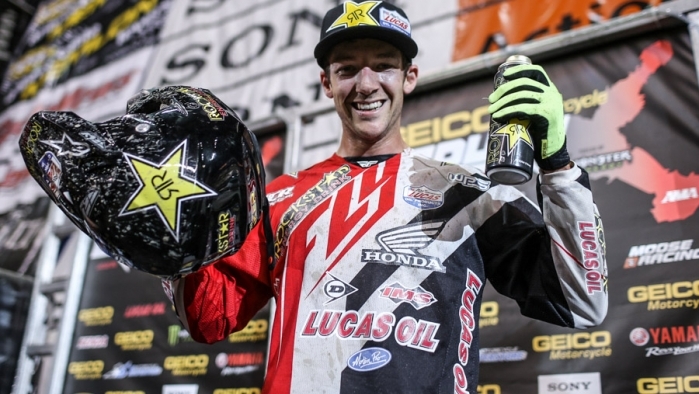 This is Colton’s second EnduroCross win of his career and he is now 1 point behind Webb in the 2014 EnduroCross Championship.